Photography is in the midst of a revolution. Rohn Engh shows part-time and professional photographers how to compete with the big agencies by using the Internet - the new frontier of stock photography sales - and by determining how their images, both traditional and digital, are delivered and paid for. 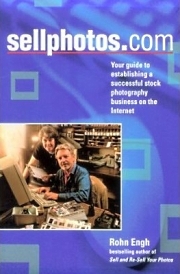 A comprehensive guide, sellphotos.com covers everything for photographers from Internet basics and the nature of the stock photography trade to building their own web sites and operating their own business. Rohn Engh is a veteran editorial stock photographer who has sold to national and worldwide markets since 1960. He is founder and publisher of PhotoStockNotes, PHOTOLETTER and PhotoDaily, market letters that post photo editor picture needs. Engh also conducts photo marketing seminars nationwide. He lives in Wisconsin. Billy E. Barnes of Chapel Hill, NC says,"Rohn Engh knows more about how to market photography than anyone else in the business. His earlier books on marketing have sold almost 100,000 copies but 'sellphotos.com' is his best book yet. I'm a professional photographer with 30 years of experience in photo marketing; I have 125,000 photographs on file, from which I receive a tidy flow of royalties. I know a lot about marketing photos but very little about how to use the Internet to my advantage. "Rohn Engh's book spells it out in detail, in English plain enough for anyone to understand. I am a great believer in learning from books instead of from blind trial and error. I have at least $2,500 worth of books how-to books on my shelf and 'sellphotos.com' is the best value of any of these books. It's just as valuable to an amateur with 100 photos to sell, as it is to old hands like myself with more than 100,000. "Rohn Engh has some strong (and very informed) opinions about the business of photo marketing. But you don't have to take his word for it. He has talked with a dozen or more leading photographers and⁄or marketers in the U.S. and Canada, and in 'sellphotos.com' he gives you case histories on the secrets of their successes in Internet⁄Web marketing. "The detail in the book is amazing. The last 46 pages of this 276-page book are worth twice the price of the book. Those final pages contain a wealth of phone numbers, web sites, and Email addresses that help the reader find sources of the software, hardware, and information you need, to get on the web and sell those photos. If you're ready to get out there in the cybermarket place and make some money with your photos, 'sellphotos.com' is your road map. If you're not sure whether you're ready, 'sellphotos.com' just may inspire you to jump in and get your feet wet, and tell you how to do it with minimum investment."